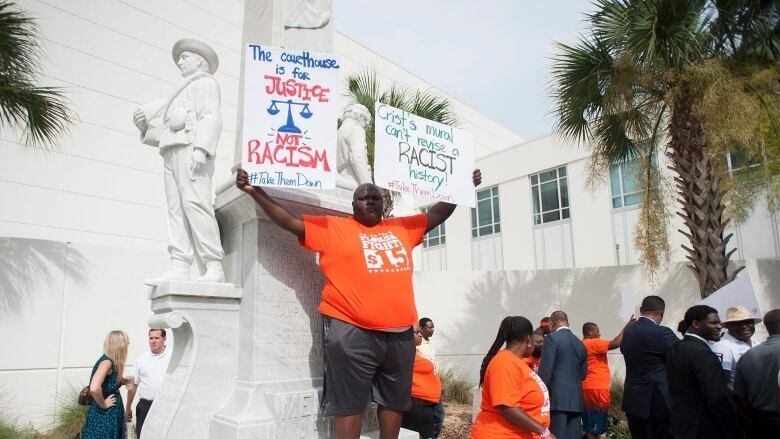 The three major professional sports teams based in the Tampa Bay area say they have "dedicated funds" to help remove a Confederate monument from the city. The NFL's Buccaneers, NHL's Lightning and Rays of Major League Baseball issued a joint statement Thursday saying they're working with the Greater Tampa Chamber of Commerce because they're "recognizing that this monument does not reflect the values of our community." The teams did not disclose how much money they would dedicate. Former Buccaneers coach Tony Dungy tweeted that he would donate $5,000 US to help move the statue from its spot in downtown Tampa.